All eyes will be on the 11 New delineated seats when the 11th Sarawak State Elections is called. Both BN and Pakatan Harapan parties will put their cases to their respective coalitions on why their parties should or be allowed to stake a claim for the seats. It will be politically interesting no doubt but at the end of the day the Rakyat will need to know who will represent them besides the designated party . They will need to weigh all the options as for the next 5 years when they affix their X to the person of their choice. Whoever sits as their representative must know the sentiments, culture, terrain, breakdown, wants, needs and many other factors of the local constituency. The tussling and lobbying will be on going until the elections are called. Last minute changes have also taken place previously. Until the day of nominations we will still be wondering who and which party stakes the claim for the seats. When the parliamentary sitting concludes next month, the 11 new Sarawak state seats are expected to be finalised, and the political parties in the ‘Land of the Hornbills’ can begin talks on whom should best contest in these constituencies. Out of the 11 seats, three are Malay/Melanau majority areas (Gedong, Kabong and Telian), three Iban majority (Stakan, Selirik and Samalaju), two Orang Ulu majority (Murum and Long Lama), two majority Bidayuh (Serembu and Triboh), and one Chinese majority (Batu Kitang). Chief Minister Adenan Satem has earlier announced five out of the new seats would be contested by the state Barisan National (BN) component party led by Parti Pesaka Bumiputera Bersatu, including the three seats which are predominantly Melayu/Melanau who never failed to give their full support to PBB and BN at every past state election. Batu Kitang will be a testing ground to see if the “Adenan charismatic factor’ can draw the support of the Chinese given that the problem faced by BN is its component, Sarawak United People’s Party (SUPP) – the predominantly Chinese party that faced an internal crisis which resulted in the formation of the splinter United People’s Party (UPP). As Batu Kitang is an area created out of Kota Sentosa and Batu Kawah, which are currently under DAP, the opposition party is expected to make it a battlefield.Maybe unlikely. This is because another of the opposition pact, PKR has already stake a claim in Batu Kitang and has even submitted several names who are likely to fielded as a candidate there. Sarawak PKR chairman Baru Bian when contacted said Gerakan Harapan Baru would hold talks to reach a consensus on the distribution of seats when the time comes.He said it was still too early to say which seats would be contested by PKR but it would be in areas that they had worked hard to consolidate support. In the last state election in 2011, PKR contested in 49 seats but only won three, namely Ba’Kelalan, Batu Lintang and Krian. Previously PKR only has one seat.In the state legislative assembly at present, PBB has 35 seats, SUPP six, Sarawak Progressive Democratic Party (SPDP) six and Sarawak Rakyat Sarawak (PRS) eight. The opposition – DAP has 12 seats and PKR three. There is one Independent. Among the state BN leaders, PRS president James Jemut Masing has voiced his hope to get the Bukit Goram (Selirik) and Murum seats from the 11 new seats. SPDP senior vice president Paul Igai, when contacted, said the party was eyeing the two Iban majority seats but hastened to add that it was still up to the state BN top leadership to decide.If a consensus is reached, it means that PRS is almost certainly to get Bukit Goram (Selirik), while two other Iban majority seats, Stakan and Samalaju, can be ‘booked’ by SPDP. That leaves the Orang Ulu majority seat of Long Lama (Mulu), and Bidayuh majority seats of Serembu and Triboh.After PBB is expected to get the three Melayu/Melanau majority seats, it is also eyeing another two seats with Triboh and Serembu being their best bets. PBB is also highly likely to get Triboh, which is carved from the two existing state seats of Tebedu and Kedup, which are represented by PBB.Serembu, on the other hand, is created from a portion of Bengoh seat, which is represented by SUPP, as well as the Tarat seat, being represented by PBB. The 11th new seat, Long Lama (Mulu) is created from the Marudi, which is represented by SPDP (now with the new Parti Tenaga Rakyat Sarawak (Teras)) and Telang Usan, which is under PBB.With PBB claiming five out of the 11 new seats, SPDP or PRS can now eye Long Lama (Mulu).In terms of estimated figures, the opposition is viewed as not likely to pose a big challenge to the state leadership. However, it is well-known that the support for a party in a particular constituency can swing due to factors such as protest votes, selection of candidates who are not ‘voter-friendly’ or internal disputes. This new redelineation can be considered as favourable to the BN as almost all the new seats involved rural areas in which the BN has proven to receive a lot of support. Prior to this, these places involved rural state constituencies that are huge, prompting the Election Commission to conduct the electoral redelineation. As soon as the Federal Court approved the redelineation process middle of last month, Sarawak DAP secretary Alan Ling claimed that the state BN required an additional 11 seats to address a split in two of the BN component parties. BN may lose Sarawak as its ‘fixed deposit’ in the coming state election if internal problems within Sarawak BN are not settled within the next 12 months, warned Parti Rakyat Sarawak president James Masing. “The problems within SUPP and SPDP still persist and unless leaders within BN are willing to take the bull by the horns, the instability within Sarawak BN will create unnecessary headaches for the chief minister,” he said during the PRS 10th anniversary dinner in Kuching last night. “It was most unfortunate and rather unnecessary that a new political party called Teras (Parti Tenaga Rakyat Sarawak) was used by some disgruntled State Assemblymen just as Adenan Satem (Chief Minister of Sarawak) assumed the mantle of leadership. 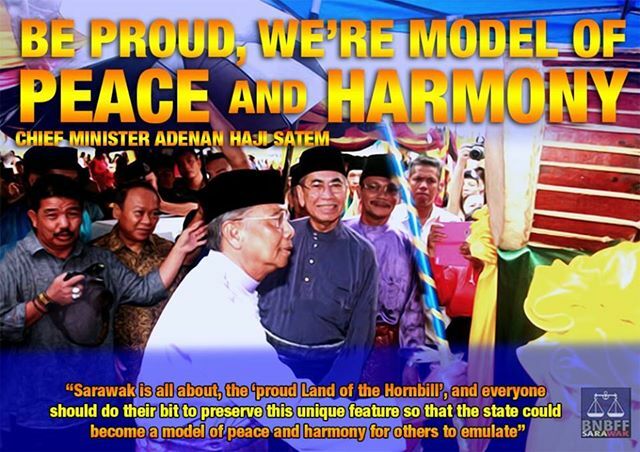 “In fact, it was done as if orchestrated, on the very day Adenan (left) delivered his first winding up speech as the chief minister of Sarawak,” he added. Masing, who is a senior minister and minister of land development, made it clear that PRS did not agree in the manner and the timing by which Teras was formed. “And I assume that SUPP, SPDP and maybe some elements within PBB, also do not agree because it destabilises the newly appointed chief minister. “Solutions to solve problems within SPDP and SUPP could have been handled in a manner which would have allowed the new chief minister time to adjust to his new position. “It would have given him time to read the political landscape of Sarawak and then suggest the correct solutions,” he said. “In trying to think of possible solutions, I recalled what Prime Minister Najib Abdul Razak said in his speech at the SUPP 23rd Delegates Conference in Kuching. This is what he said: ‘You have gone through hell; I want you to come back stronger and ready to fight for BN. I believe in politics of principles’. “The prime minister believed in politics of principles, and so does PRS. I also believe that the other BN component parties namely PBB, SUPP and SPDP also believe in this,” he said, pointing out that there are rules in BN which had over the years, bound the spirit of comradeship among BN component parties. He added one of the rules, is that ‘admission to BN must be 100 percent consensus’. 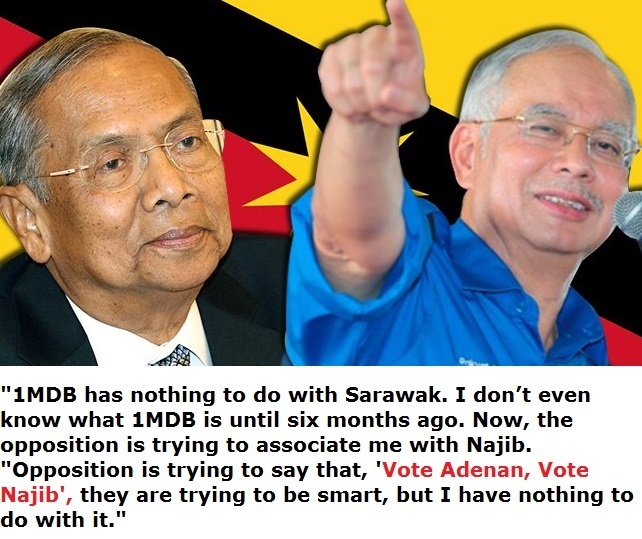 “What this means is that if one party in BN objects, admission into BN family is impossible. This is the principle which Najib was talking about. 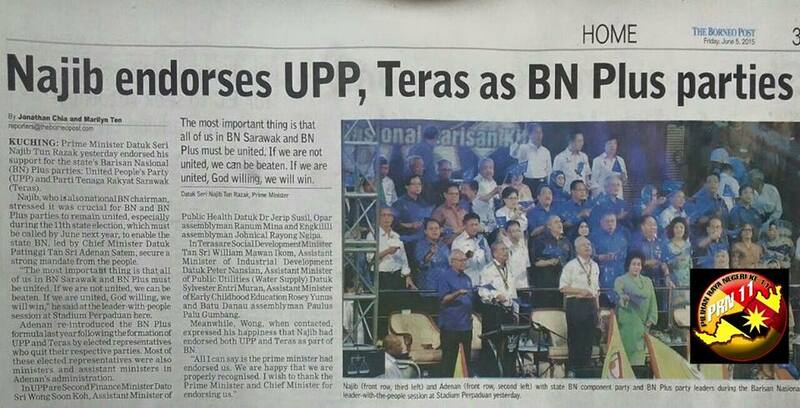 “I cannot see how UPP (United People’s Party) and Teras can get admitted to BN if we follow these principles. 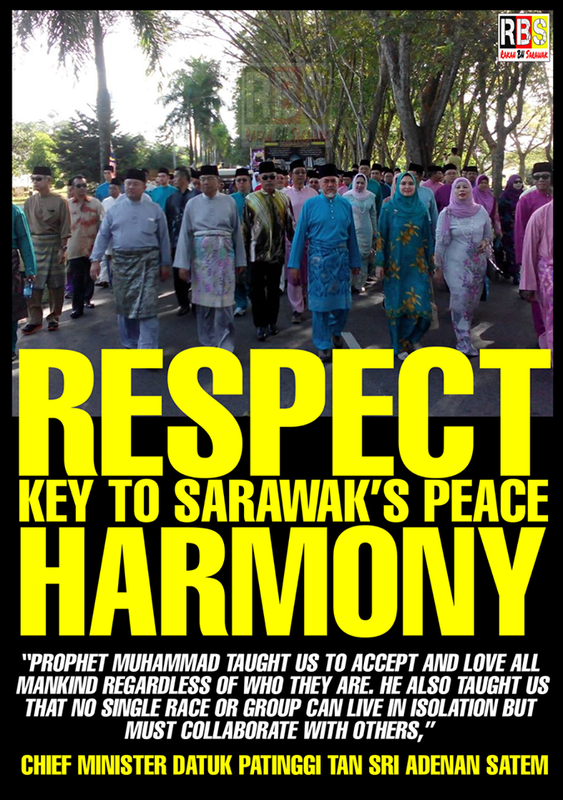 “If admission of these two parties to BN is not possible, then another set of principles must apply in order to solve the current problem in Sarawak – that is principle of personal integrity. “Among other things, All YBs concerned must look back to where they started and how did they got to where they are now,” he said. Also saying unity is strength, Masing asserted that the four parties (PBB, PRS, SPDP and SUPP) must stand together. 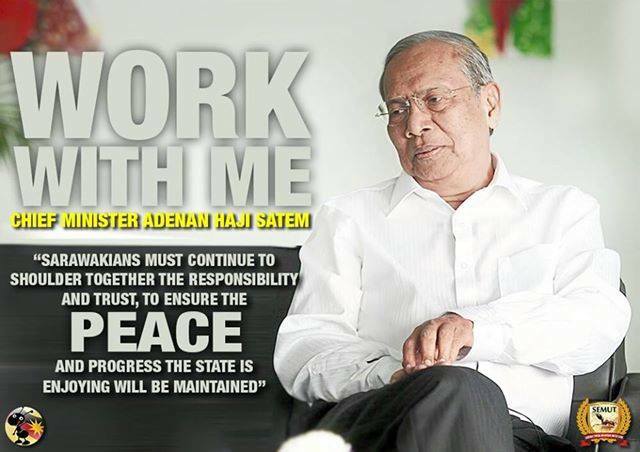 “In order to win the 2016 state election, we must abide by BN rules. Thus this code of conduct among BN followers: ‘you touch one you touch all’ must be practised with dedication and sincerity,” he added. Masing said UPP which was formed by expelled SUPP leaders and Teras by expelled SPDP leaders, had been telling their supporters and members of the public that they are ‘already in BN’ by virtue of the fact that some of their leaders are in the state cabinet. UPP is claiming 19 seats that SUPP is going to contest, while Teras is claiming eight seats which are allocated to SPDP. “I believe all heads of BN component parties in Malaysia and in Sarawak think alike, sharing the same objectives, speaking from same page, sleep on the same bed and dream the same dreams,” he added. “Unless we are humble enough to trim our egos, lean on and learn from each other, the 2016 state election and 2018 federal election will be worse – urban seats will go. “The egos which have kept us apart will be dumped in the urban rubbish bins; we will be left with nothing but bruised pride. We will not be the administrators of this state,” he warned.